GAZA CITY, Gaza Strip (AP) — A rocket fired from the Gaza Strip on Monday was one of the most powerful launched ever by Gaza militants, flying nearly 120 kilometers (70 miles) before it slammed into a house in central Israel, wounding seven people. 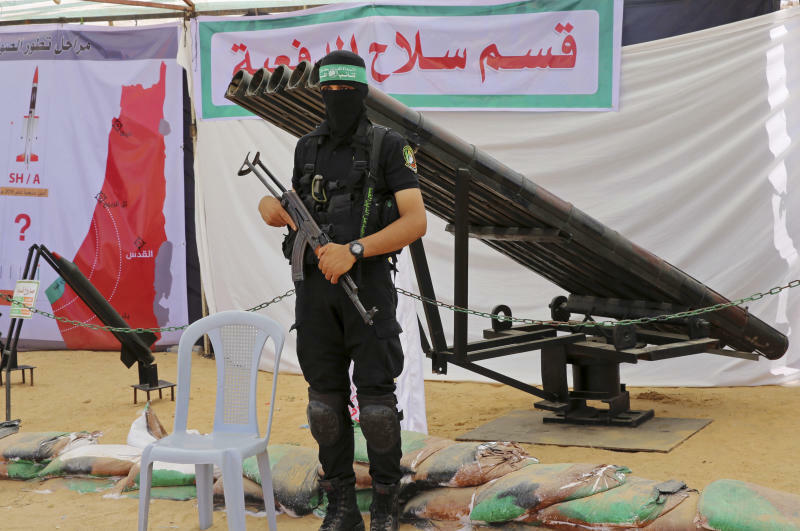 Over more than a decade, the Islamic militant Hamas group has built up a large arsenal of rockets and missiles. It started with crude short-range projectiles and now possesses rockets that can strike virtually anywhere in Israel. Hamas seized control of Gaza in 2007, prompting Israel and Egypt to impose a blockade on the territory, largely to prevent the militants from amassing more weapons. But the blockade and three wars with Israel — the most recent in 2014 — failed to prevent Hamas from expanding its arsenal. A network of smuggling tunnels along the Egyptian border is believed to have helped Hamas bring in advanced weapons and raw materials, though Egypt shuttered most of the tunnels around 2013. In 2018, Gaza's Hamas chief Yehiya Sinwar boasted that the group had not only replenished the rockets it fired during the 50-day war in 2014, but had many more at its disposal. He said that what had been fired in 50 days "would be fired within five minutes" of any future Israeli offensive. Monday's rocket strike was the furthest a Gaza rocket has landed since 2014, when Hamas struck the northern Israeli city of Haifa, about 150 kilometers (90 miles) away. Hamas doesn't release details about its military capabilities. Gabi Siboni, an Israeli military analyst, said Hamas "has a variety of advanced, precise, and effective weaponry." He said this includes guided anti-tank missiles and shoulder-launched anti-aircraft missiles, both produced by Russia, as well as some drones. 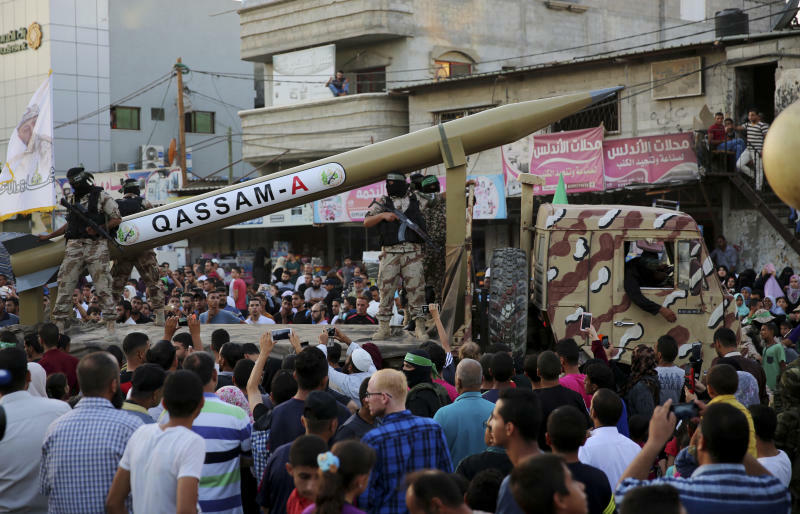 —Qassams: In 2001, a year after the outbreak of the second Palestinian uprising against Israel, Hamas first fired a cross-border rocket toward Israel, calling it "Qassam" after the group's military wing. The homemade rockets, aimed at Israeli border towns, had an irregular trajectory and sometimes landed inside Gaza. 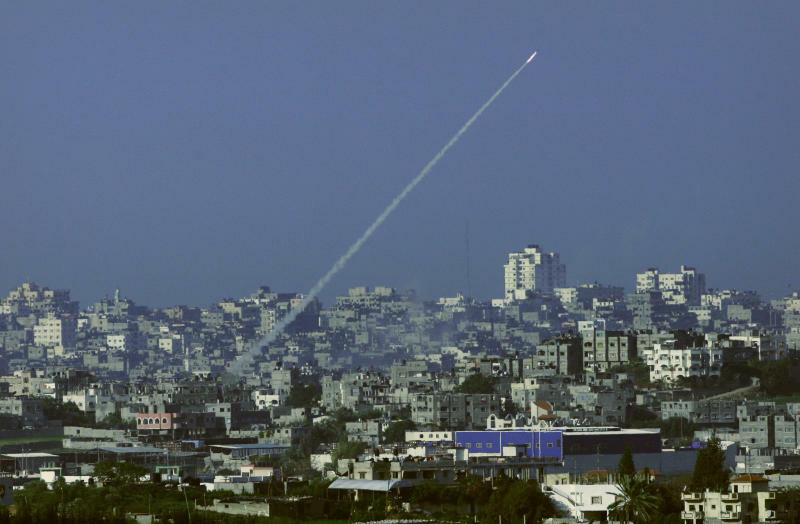 —R-160: Hamas calls this its longest-range home-grown rocket. It was first fired in the 2014 war and at one point hit Haifa. The "R'' in the name refers to Abdel-Aziz Rantissi, a senior Hamas official who was killed in an Israeli airstrike in 2004. The number refers to the range, in kilometers. —J-80: This rocket, also produced locally, is named after Hamas military wing commander Ahmed Jabari, who was killed in an Israeli airstrike on his car in 2012, setting off an eight-day war. Israel reportedly believes the rocket that hit central Israel on Monday was this model and blamed Hamas. The group has not claimed responsibility. —M-75: Hamas unveiled this rocket in 2014, claiming it was homemade. But experts believe it is a version of the Iranian Fajr 5 rocket, which Iran acquired in the 1990s and is based on Chinese technology. —Hamas also possess a variety of Russian Grad rockets. These projectiles, with a range of about 20 kilometers (12 miles), are believed to have been delivered via Iran. In recent years, Hamas has built a sophisticated network of tunnels. These include attack tunnels that run under the Gaza-Israel perimeter fence, for use by assailants to infiltrate Israel. Defensive tunnels, located away from the border, are used to store weapons and serve as hideouts. Hamas first used tunnels in a 2006 cross-border attack in which it killed two Israeli soldiers and captured a third. The soldier, Gilad Shalit, was swapped for more than 1,000 prisoners in 2011. Hamas also used the tunnels in the 2014 war, killing five soldiers in one cross-border raid. During the fighting, Israel said it discovered and destroyed 32 tunnels. Since then, it says it has discovered and destroyed several additional tunnels. To combat the tunnel threat, Israel has begun building an underground barrier running the length of the Gaza Strip, and this year it said it was reinforcing the Gaza fence with 20-foot-high galvanized steel. —Mortars. Hamas has fired hundreds of mortars at short-range targets just across the border. The mortars are believed to have been smuggled from Libya through Egypt. — Laser-guided anti-tank missiles made by Russia. Last November, Hamas fired such a missile, known as Kornet, at a bus from which Israeli soldiers had just exited. One soldier was seriously wounded. In a 2006 war, the Lebanese Hezbollah militia killed dozens of Israeli tank soldiers using these weapons. —Drones: Hamas has developed an early-stage drone program, displaying images of Israeli fields purportedly filmed by these aircraft. It's not known whether they have been used for attacks.